One of the quirks of the Xiaomi is that it can get hot. Very hot. As hot as your coffee cup. This is because the frame on the edge is made of metal, and I believe it acts as a radiator for the processor. Because the Xiaomi gets very hot, I’ve been concerned about how long it can record video, so I’ve never tried to record for very long (besides the fact that very long 360 videos can get boring). Nonetheless, it’s always good to know the limits of your equipment, so I decided today would be the day I would find out. One of the cool things about the Xiaomi is that you can connect it to a USB power source and it will power the camera while recording. That’s what I did for the first test. I set up the Xiaomi to record video, while plugged into a USB adapter. It was in a small room with no fan and closed doors and windows (i.e., no ventilation), with a temperature of around 72 Fahrenheit. Since the app is buggy, I was worried about whether if it had a thermal cut-off to begin with (if it didn’t then the camera would allow itself to overheat and get damaged). With a little trepidation, I started the test and left the camera recording. Fortunately no one from the fire department called! At the end of the day, I came home to look at the Xiaomi. It looked normal and not melted or anything. I looked at the files it recorded. The files were broken into 10-minute segments. Each 10-minute file was 3.25GB for the full resolution file (3456 x 1728) plus 72MB for the smaller 1440 x 720p file (used for the initial preview). I added up the duration of each file. Result: the Xiaomi recorded for 1 hour, 45 minutes and 39 seconds! That’s the longest among any of my cameras so far (although I haven’t tried the 2017 Gear 360 endurance test while plugged in). I also compared the first segment to the last segment and found no difference in image or sound quality at all, even in the final seconds of recording. In other words, the image quality does not deteriorate even when it’s about to stop from overheating. By contrast, the original Samsung Gear 360 would get blurrier as it heated up (“blurgate“). Unfortunately, I didn’t get to determine exactly how hot the Xiaomi gets before it overheats, nor did I determine the cooldown time required. I suspect the cooldown is not very long, again because of the metal frame / radiator that helps to release heat more quickly. In everyday usage, the Xiaomi seems to have mediocre battery life. It has a very compact body, and so there’s not much space for a battery. I often hear a beeping warning me of low battery. Moreover, the battery is not replaceable. I decided to test how long it could record with a fully charged battery. As with the previous test, this test was conducted in a small room with no fan and closed doors and windows (i.e., no ventilation), with a temperature of around 72 Fahrenheit. I was expecting that the Xiaomi would last perhaps 15 minutes. To my utter surprise, the Xiaomi recorded 1 hour, 36 minutes and 42 seconds before the recording stopped from the battery being drained. I did not expect that at all. And while it was very warm, it wasn’t scaldingly hot as I expected. In fact, it seems be cooler than while transferring videos to my phone (when it gets very hot). As with the first test, I saw no deterioration in video quality (sound or image) comparing the first segment to the last segment. Based on this test, it looks like the Xiaomi has the potential to be a useful tool for long video recordings. I say potential because its buggy Android app allows me to export video only by using the video editor which is limited to 5 minutes. So either I have to stitch 5 minutes at a time then put together the files in post-processing, or I would need a desktop program for stitching (I will soon post some options for desktop processing of Xiaomi Mi Sphere files using 3rd party apps). In any case, this is yet another advantage of the Xiaomi Mi Sphere, which also has excellent photos and videos. At the time of this writing, the Xiaomi Mi Sphere is currently on sale at GearBest. a usb battery plugged into a naked insta360 nano gave me two hours before i got bored and turned it off…, it was warm to the touch, but not as hot as using a nano connected to the iphone gets. checked first batch of footage to last batch and no qual change at all. I hope Xiaomi realizes that they have gold in their hands, only flawed by the apps and will consider making the apps better (or at least translate!). I keep following your every step with regard to this amazing camera (until I buy one 😉 ! The Pics are not levled. do I make somthing wrong, or are there no Gyrodata in the Exif? The Pic are sharp and better then from my ThetaS. but its all about Video, I shot only Panorama Pics and there I want a perfekt Horizon. If xaomi put data for yaw.pitch.roll in the exif, it could be done easy later. Also Exif fixer, its easy to write the data in every pic with the Firmware. Xaomi has to do there Work. Is it possible to choose to use only one camera on Xiaomi Mi Sphere in order to increase battery life and shoot classic video? 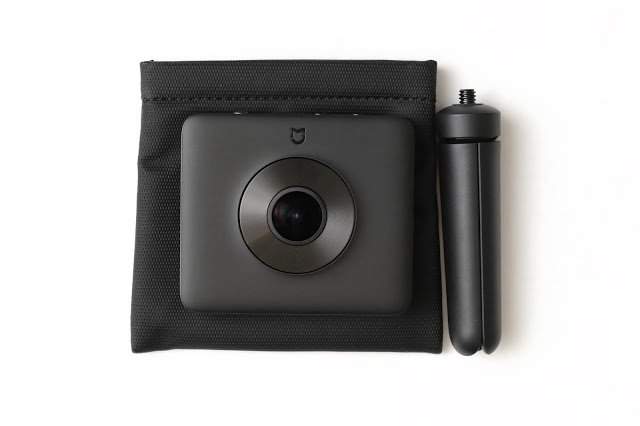 Do you know if there is a compatible protective case with gopro mount for the Xiaomi Mi Sphere? Do you know if there is a compatible remote (shoot a photo, trigger video recording) ? Hi f1oren! Thanks for reading my post! It’s not possible to use a one-camera mode on the Xiaomi. You can shoot the Xiaomi in 360 and crop the video to non-360 view using Insta360 Studio or other software. But if you do this, the battery life will be the same. No there is no case for Xiaomi with GoPro mount, but they are rumored to be working on a waterproof case for Xiaomi, which I am guessing will have a gopro style mount. But in any case, you can get a gopro to 1/4-20 adapter. There is no compatible remote yet, other than the phone app. But they will have a selfie stick with a built in trigger. Hi, What type of card do you have?